Let&apos;s imagine I could get about 200 SPDT relays. Of course I would know what to do with them :-D But will 200 be enough ? This project was created on 04/12/2016 and last updated 2 years ago. This circuit is meant to be a demonstration/attraction that illustrates where/how computers started, a century ago. I wanted to build one for the kids, to stimulate their curiosity and play safely with digital ideas. It&apos;s not a real computer but a toy calculator that takes two 16-bits operands (in binary/hex, let&apos;s be educational!) and performs add/subtract/multiply/divide "the old way" (like when ENIAC was still a thing). If it is ever completed, it should be obvious why we don&apos;t use this technology anymore but I hope that fun will have been had, binary will have been learned and relays will have happily clicked! One lesson I learned: if I ever have to do it again, I&apos;ll use DPDT and higher voltages. 2016-10: This projet is now shelved. But you must have a look at #AMBAP: A Modest Bitslice Architecture Proposal, #YGREC16 - YG&apos;s 16bits Relay Electric Computer and #YGREC-РЭС15-bis because they are an extension of this project. How fun is that ? After I started #Discrete YASEP then moved to lower tech in #Yet Another (Discrete) Clock, I continued my spiraling descent into history with #Clockwork germanium and with this project, I hope I&apos;ve touched the bottom... (I&apos;ve skipped the thermionic vacuum tubes for excellent reasons). Unlike #RISC Relay CPU, I just want to show kids how computations can be performed mechanically. So let&apos;s make the craziest, most horrible contraption possible :-D "You see, kids, be happy we have transistors today. Can you imagine that electromechanical thing computing a Youtube video clip ???" Why 16 bits ? 4 bits looks underwhelming (yet cool) It could be 8, could be 10 or 12 but 16 bits start to be meaningful, 0 to 65535, and that&apos;s the minimum used by real computers. And the design is not really dependent on the number of bits so hopefully, I would make a 20 bits version ("See, it can count to more than one million but it would kill the contacts !"). Besides, I have TIL311s (no #DYPLED yet but it will come) and hex rotary buttons so it makes a nice introduction to binary/hex codes. Each board can be built separately, the only constraint is that there must be as many A and B boards. The design is scalable, it can work with 4, 8, 12, 16 bits data or more (the sequencer must be adapted for each case). Turn the hexadecimal input knobs to select one number. Select the "ADD" mode and press the "MEM" button : the input value is transferred in the accumulator. Select a different input value, then press MEM again : the sum gets registered in the accumulator and displayed in hexadecimal. https://web.cecs.pdx.edu/~harry/Relay/RelayPaper.htm is an excellent reference as well ! 7. Die Glühbirnchen sind da ! 9. The relays are here too ! 13. Signed or unsigned ? 15. Save the relays ! 27. Where to find the parts ? More relays means the possibility of a more complex system, which remains to be determined. However the current design still must be completed because the critical electrical design elements are studied. I will probably make a smaller design, with 8 or 10 bits maybe... More relays for the larger design ! Where to find the parts ? Since the project has been featured on this website, I have received questions, mostly concerning my sources for the parts. A simple diode should solve this. Now, this diode drops some voltage. I have tested the ring oscillator down to about 3.4V so 4.3V should be OK. The clock output also feeds the pulse counter and the main CLK output. This last signal must be buffered through another relay, with the coil in series with the first counter&apos;s relay. I&apos;ve added a lamp in series but I&apos;m not sure it will actually change anything, or shine visibly. We&apos;ll see. Fun fact : no freewheel diode is necessary because the overshoot will charge the ring oscillator&apos;s first capacitor. The changes are outlined in red. The final counter stage is a more intricate problem, though. It&apos;s time to think more about the sequencial logic. For a 16×16 bits mulitplication (or division), 32 clock pulses are necessary. In general 2N pulses are required to calculate the product of N-bits operands. What is the most efficient design that creates just the needed number of pulses ? Apply the clock pulses to all the DFF, their data input coming from the precedent DFF&apos;s data output. Except for the very first input which is tied to logic 1. The last DFF will indicate that the counter has expired when the 1 reaches the end of the cascade. This is a great enhancement to the previous system. The propagation of the 1s is recirculated after undergoing a logical inversion, which cuts the number of relays in half. At 2 SPDT per bit, a 16-bits counter requires 4 stages × 4 SPDT => 16×SPDT. That&apos;s better but... still not optimal. invert the value (exchange the 0V and 5V contacts) for the output relay. This way, for each clock pulse, the relay will flip its state. This divides the clock frequency by two ! For 16 bits, the circuit must count from 0 to 15, so there are 2×4 SPDT relays in a cascade. This is 8×SPDT. A last circuit is necessary to make this divider fully functional: a set-reset latch must control the start and stop conditions. When you press the Start button, it should generate 16 short pulses on the CLK output. I have had difficulties with the concept of a relay ring oscillator because relays don&apos;t behave like transistors. 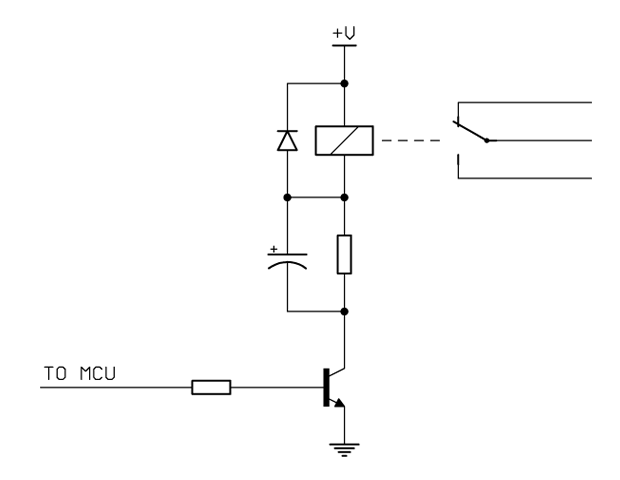 With this kind of inverting gates, you just use odd numbers of gates with capacitors and that&apos;s it. For relays it must be different. The trick is to use only one inverting gate (at the right) which is normally closed (N.C.). The others are non-inverting gates (N.O.) which add more delay. It&apos;s going to be pretty clickety and remove concerns about bounces on the contacts. It can also control frequency and duty cycles easily, by adding more delay gates, making a more efficient overall design. For example it can generate a clock signal with 1/4 duty cycle, so the series lamp gets turned on during less time, consuming less and allowing faster operation. Update (20160509): it works ! It is difficult to record the sound, I hope you can hear it. With 3×(3300µF/22Ω), the clock period is around 600ms, or 1.6Hz, which is reasonable (not too fast, not too slow). Given that it takes 60mA to energise one coil, the amplification coefficient is barely 2 and the design expects more. It was a good idea to connect coils in series wherever possible. Control signals still require a large fanout and I&apos;ll probably have to implement a 2-levels signal tree (with repeaters for each nibble or two). Given the current handling, it would have been wiser to opt for a higher coil voltage, which reduces the required current, thus a better amplification factor. That, and DPDT, will be considerations for a next version, if any ! I replaced the resistor with one of the lamps and the result is pretty interesting, even though less reliable than with 10 Ohms. The frequency is lower, like 3Hz instead of 13Hz. The lamp slows the charge down as it warms up, but the resistance increases with the temperature. It&apos;s a fragile balance and often the system gets stuck in micro-oscillations, due to bouncing. 3300µF was what I had easy access to, I wanted to make a ring oscillator so I looked for 3 identical high-valued electrolytic capacitors and they looked nice. I get about 12Hz. The frequency is affected by the series resistor, which I had to reduce in order to keep a stable oscillation because it doesn&apos;t start up quiclky. Maybe I should add a lamp in series to keep it running ? Anyway, with 10 Ohms, the charging pulse lasts about 10ms, with 65ms of discharge. No wonder my frequency meter was confused ! 20161107: Oh yeah, the inrush current is 4× the rated 100mA current... No wonder it doesn&apos;t work well. A new problem appeared... These relays don&apos;t like to oscillate ! I tried to do the circuit we discussed at How can I make a low-frequency oscillator with a relay (or more ?) and it didn&apos;t go as planned. The relay breaks pretty quickly, for an unknown reason (yet). I wired one, it clicked once and then nothing. Maybe this is a quality problem so I changed it and made it vibrate a bit without capacitor. It made a little whine and it looked OK. Adding 330µF made it sound a bit weird but it only lasted a few seconds : the relay&apos;s contact is shut off now. It seems that a larger capacitor, a 100nF cap across the contacts and a 47 Ohms resistor in series work. However the working voltage is too high (at the very least 5.5V) so I&apos;m changing the design and I start a ring oscillator with 3300µF. This will allow me to tightly control the pulse lengths and sequencing. So I finally have time to test how a pair of relays behave when in series with one lamp. I wired the relays in series so I can&apos;t actually tell which one turns on, but they need 7.5V to both turn on, and < 3.6V to turn off (that&apos;s a ratio of 2). But these measurements were done at a very low speed, giving the filament time to heat or cool. The relays both turn on at 4.4V when their coils are switched instantaneously. However you need to wait 2 seconds for the filament to cool, before applying another pulse that works again. A capacitor in parallel with the lamp can increase the frequency but I must see what I have in stock. I don&apos;t have enough electrolytics, I hope ceramics will do. It looks like 5V might be a decent working voltage, a good compromise between speed and availability of the PSU. I see already that the control pulses must have a low duty cycles. This should reduce the time to heat the filament, so the latch masters&apos; relays should be "normally" connected to the input, and transfer the capacitor&apos;s charge to the output during the short pulse. This is because the capacitor will take some time to charge through the resistor. OTOH it will discharge instantly through the coil of the slave relays. Neat Project! I&apos;m looking at your Adder diagram, what happens when the second number being added is smaller than the first number? (when adders are rippled) Is there some compare circuit? It seems like if only &apos;Input b" is active, the adder will not change states from 00.
this full adder works with the assumptions that A and B are fully wired, that is, these signals are not floating, they are tied to Gnd or Vcc. When both A and B are 0V, or both Vcc, no current flows and the relay stays in the rest position. The other two cases (A = /B) energize the relay. This is a XOR gate, whose output controls 2 signals. That&apos;s clever and I&apos;m too used to transistor design to figure this out by myself :-) Fortunately, others have gone this route before and I must admit... I love discovering new logic design paradigms. Ah I see now. Absolutely genius. A full relay less than mine. My hat&apos;s off to you, keep up the good work! I&apos;m using the same relays on my /much much less interesting/ memulator. I&apos;m doing what is most efficient, instead of following established conventions. Beware ! Relay logic is more fun that I thought, it&apos;s a traaaaap ! You mentioned in the description that this could be interesting and educational for kids. I want to say I would like to see how it works and looks. Though, maybe I am still a kid :). Loking forward seeing it. I know those projects do require funding. No rush, it is fun while it lasts :). For your slave relay, one of the old tricks is to put a capacitor in parallel with the 1.8K resistor with a RC time constant large enough for the contact to close. The capacitor increase the current to the coil so it would speed up the switching. In some cases, you can even increase your resistor as now it only need to be greater than the holding current. Have to be careful that some of the sensitive low current relays (PCB ones) have a small magnet inside and built-in diode. They have polarity, so use them after your bridge rectifier. Hmmmmm very interesting :-D I&apos;ll keep that in mind when I&apos;ll play with latches ! Thanks ! I&apos;m still trying to "get" how the added capacitor increases the starting current in the coil. It seems to help when the coil is de-energized to reduce the spike, but I can&apos;t mentally model how it works for activation. And what would be the ratio of capacitance with the storage cap ? When you initially turn on the power to the relay the cap is full discharged. The cap works like a temporary short across the series resistor until it charges up, so the relay gets more current. The trick is to size the cap big enough such that the R C timing is greater that the time for the relay to close. Typically range of values are in the tens or even hundred uF. Have to calculate/simulate it. Excellent link ! thank you again ! I imagined the resistor and capacitor in a different configuration, so it was a good idea to ask you. Have you seen any software for simulation of bigger relay based systems? I&apos;m sure there are PLC simulators, but I guess that they are not really suitable for simulating a full relay computer? Some time ago I was looking into a relay computer design as well. I found a Taobao seller that sold contactor-style, with the innards visibla, 4PDT relays (6/12/24 volts) for less than 0.40 USD each. I really should have ordered a thousand of them on my last order that was on a slow and cheap "sea" shipment. You are about to report the project "SPDT16: 16-bits arithmetic unit with relays", please tell us the reason.